If you’ve been following my blog posts then you’ve probably seen that my recent WIP posts have mentioned an amigurumi Eeyore. You’ve probably been wondering just when exactly I am going to start posting the pattern. Well, now is the time! The legs are done in continuous rounds, which means there is no joining or turning at the end of each round. Do not make a chain at the start of each round and try to keep your tension tight but not so tight that you can’t fit your hook in the stitches, which, by the way, are worked in both loops. 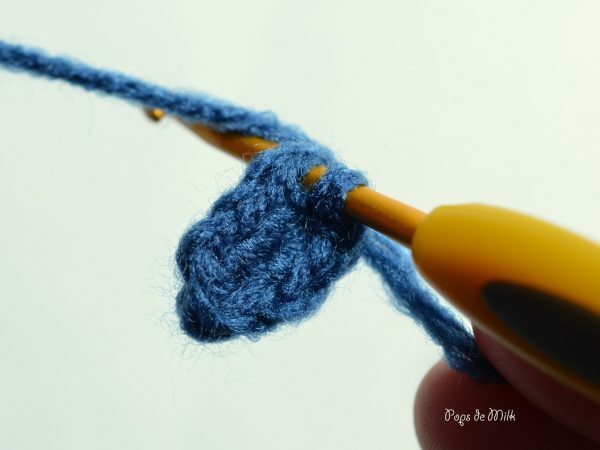 If you find that the suggested yarn is just not working, you can use a larger hook or a different yarn but keep in mind that it will affect the size of the finished piece. 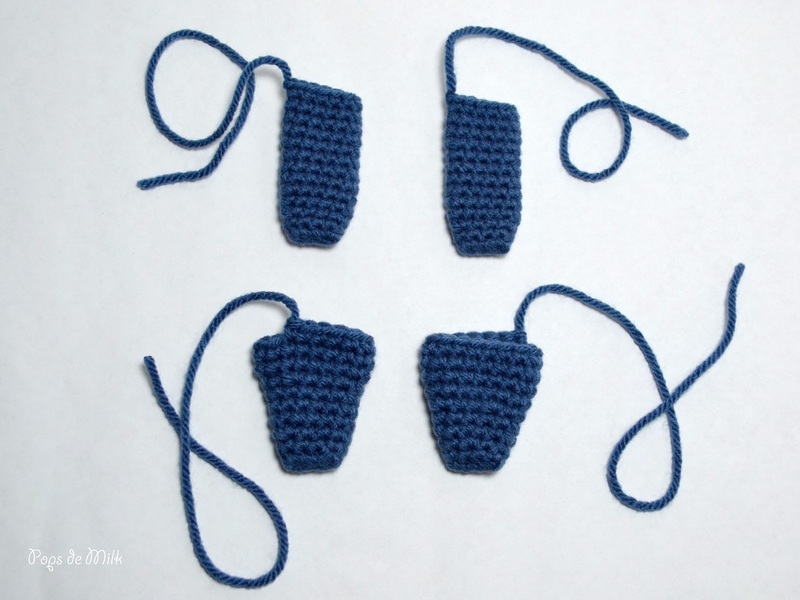 The pattern for the limbs, as you can see, is pretty much the same with the exception of the hook size and an extra increase and rounds. The shape of the legs is a flat tube and this is achieved by starting with a foundation chain of 4 (instead of starting with a ring, which would create a round tube shape). Round 1. Chain 4. Make 2 single crochet stitches in the second chain from the hook, single crochet in the 3rd chain and 3 single crochet in the last chain. Don’t turn, instead continue working on the bottom of the foundation chain. Single crochet in the same chain as the 3rd single crochet then 2 single crochet in the same chain as the first 2 stitches. You now have a 9 single crochet oval shape. It’s a good idea at this point to start using a stitch marker so you know where the round ends. By the end of round 2 you’ll be able to shape the piece so it isn’t a flat oval anymore. Round 3. Now to increase: single crochet in the next 2 stitches then in the next stitch make an increase (2 stitches in the same stitch). Repeat making a single crochet in next two stitches and increasing in the next all the way around (3 times total) until you have 12 stitches. Rounds 4-13. 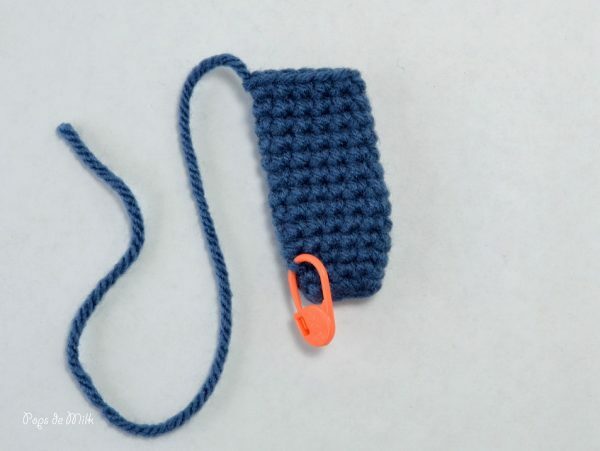 Place a marker in the last stitch of round 3 (this will help you keep track of the number of rounds) and work even (single crochet around without increasing) for 10 rounds. Leave a long enough tail and cut yarn. For the hind legs, switch to the larger crochet hook and repeat the same steps as Rounds 1-3 of the front legs. Follow Rounds 4-10 of the Legs pattern and fasten off with a long tail for sewing. I hope you’ve enjoyed the first part of this amigurumi tutorial, next post will be Eeyore’s head! Thank for such concise instructions and pictures. It was really easy to follow. I’m looking forward to your next posts. Adorable! I love Eeyore and Tigger. Thank you for sharing.